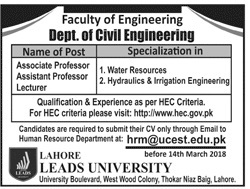 Department of Civil Engineering, Faculty of Engineering requires services of Associate professors, Assistant Professors and Lecturers in Water resources and Hydraulics & Irrigation Engineering. Qualification and Experience as per HEC Criteria. For HEC croteria please visit http://www.hec.gov.pk. Candidates are required to submit their CV only through Email to Human Resource Department at the following address befire 14th March 2018. This entry was posted in Jobs and tagged civil engineering jobs, jobs for civil engineers by CIVILENGINEERSPK. Bookmark the permalink.